Welcome to the Winchester City Flyers club website. 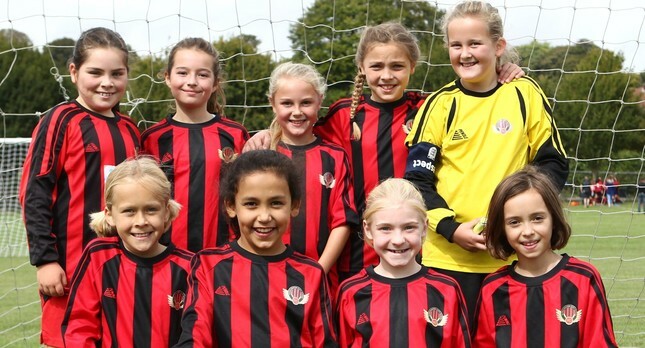 We are a FA Charter Standard club who play football in the Hampshire Girls Youth Football League and 3 Southern Ladies Divisions. The club was formed in 1996 and since then has expanded to currently have 21 teams including 16 girls teams (Under 6 - Under 18), 3 ladies teams and 2 boys teams. 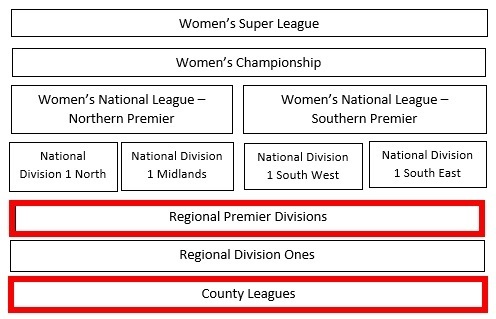 The divisions our ladies teams compete in are shown in the Women's Football Pyramid below. We are always looking out for new girls, boys, ladies, and volunteers to become part of the Flyer's family, so if you are interested then join our club today! Check out each individual team on this website by using the menu bar to see who the managers are, where/ when training takes place, team fixtures and results. Details on training and match times and venues can be found here. Also, look at our news page to see what's happening across the club. The club is committed to taking child welfare very seriously to ensure a fun and safe environment for all. We have designated Child Welfare Officers and ensure managers have completed their Level 1 coaching qualification as a minimum. For more information on our child welfare and safeguarding practices please click here. We also have additional documents on the clubs policies here. Across the club there is there are also sponsorship opportunities for those who are interested. Additionally, for people with boys who want to play football please click here to check out our Boys Teams. They have an Under 12 and Under 16 team for the 2018/19 season.